The DIN EN ISO 9001:2015 certification represents the recognition of improved quality management in a company and guarantees continuous improvement of services and customer satisfaction. As the customer requirements in a very competitive market continuously change, it is our challenge to always adapt our services to the current requirements. 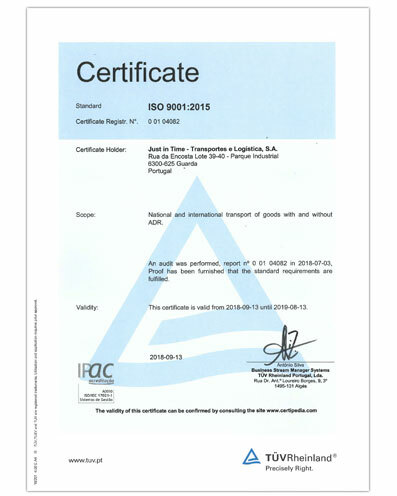 Since August 2007 JUST IN TIME is DIN EN ISO 9001:2000 certified and our professional quality management awarded us the renewal of the certification to DIN EN ISO 9001:2015 in August 2018. • The continuous improvement to benefice all the parts.